It’s starting to get darker earlier…incase you didn’t already know, just take a look at the pic in this post 😉 I still couldn’t resist blogging it, since it was so delicious and ridiculously easy to make. This is one of those “impress your guests” dishes and works especially well when you need something quick and easy. And as you can probably tell, I used turkey bacon, which is a perfect healthy substitute. I served them on top of sauteed broccoli rabe, but you can sub any green you like (kale, spinach, etc)…anything goes! Blot scallops with paper towel to get rid of excess moisture. Season both sides with salt and a little cayenne pepper. Put a little oil in a grill pan and add bacon. Cook until about halfway done, then remove from pan. 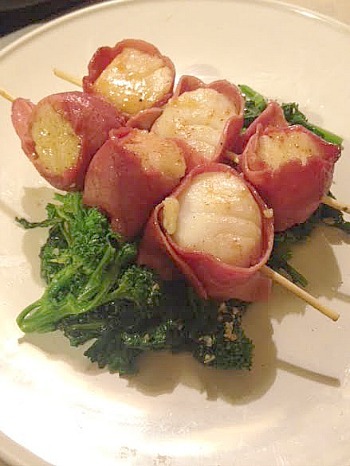 Wrap bacon around each scallop and place on skewer. Add skewers to grill pan and top each scallop with a little garlic. Turn each a few times in order to evenly cook bacon and scallop. Total cooking time should be around 6-7 minutes, depending on size of scallops. Place on top of your favorite cooked greens and serve immediately. 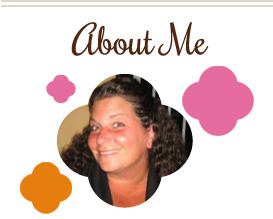 This entry was posted in bacon, low carb, main dishes, seafood, turkey. Bookmark the permalink.